First off, thank you so much for joining our giveaway. I had fun reading your entries and I am sure Jenny and Shiela of Fab Manila had a blast reading them too. Thank you so much also for sharing the giveaway and for spreading the love for all things nice and pretty! Have you checked out Fab Manila’s website? They have a gallery of pretty new stuffs that will definitely win your heart. I am sure you are all excited to know who scored the pretty stuffs from Fab Manila’s Kismet Collection. 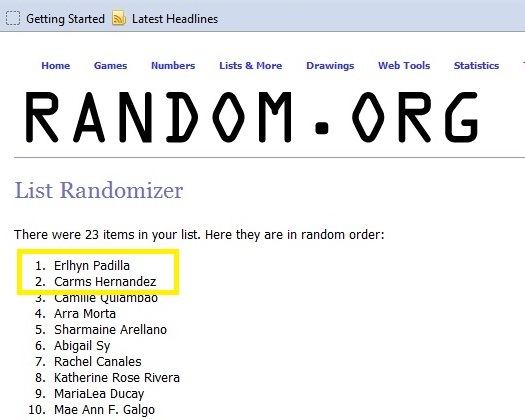 Well, I have to say Congratulations Erlhyn Padilla, you won the reversible tote from Fab Manila. Carms Hernandez, congratulations too! The desk organizer, notebook journal, sticker roll, melamine side plate are now yours! Thank you again for joining everyone, watch out for the next giveaway! To check out Fab Manila’s products, visit their website (CLICK HERE).